CAPE CANAVERAL, Fla. — If Congress is unable to agree on a federal budget for 2011 before the current stopgap measure expires on March 4, the potential government shutdown that would follow should not leave NASA's space shuttle Discovery in the lurch. 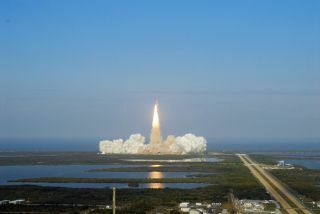 Discovery blasted off Thursday (Feb. 24) on an 11-day mission to the International Space Station – a spaceflight that will be the shuttle's final mission before being retired. The mission will extend through the March 4 deadline for congressional budget talks, but a top NASA official said that shouldn't be a problem. On Feb. 14, the Obama administration announced its 2012 budget request, even though a federal budget for 2011 has yet to be passed. The government, including NASA, is operating under a stopgap measure called a continuing resolution — a measure enacted as lawmakers try to agree on a 2011 federal budget. The present continuing resolution will expire on March 4, during which time Discovery and its crewmembers will still be docked to the International Space Station in the middle of their mission. If Congress cannot agree on a federal budget for 2011 by then, it could result in a partial government shutdown. This could mean that many NASA employees would be directly affected. Yet, while Gerstenmaier said that no definite plans have been discussed, the shuttle should be able to carry out its mission as normal. "We’ll kind of see what happens," Gerstenmaier said. "We haven’t really done any in-detail contingency planning yet. For the mission that’s flying we’d probably consider most of the folks mission-critical personnel and that's pretty much transparent to us." In other words, any employee deemed critical for the success of the shuttle mission would be able to stay in his or her position despite a government shutdown. "Then we would go ahead and see where it fits in the overall manifest — we'd work it with the right folks," Gerstenmaier said. For the time being, however, many these budgetary issues are largely out of NASA's hands. "We'll see what happens on the congressional side — it's up to them to go work the budget things," Gerstenmaier said. And while the continuing resolution is set to expire in March, lawmakers are preparing another continuing resolution that would hold the government over until September. You can follow SPACE.com Staff Writer Denise Chow on Twitter @denisechow as she covers Discovery's final space voyage from Cape Canaveral, Fla.Visit SPACE.com for complete coverage of Discovery's final mission STS-133.